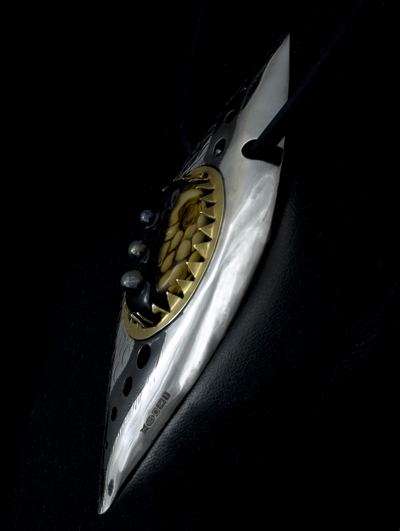 A pendant seemed the right thing, and I set about designing something that would echo the features of the bead, including the 'reptilian' feel of that creamy coloured glass. Hence the texturing of one side of the piece and the use of liver of sulphur to patinate the silver and produce the blank band extending the lines. Next was the question of how to hang it. I opted to give the snake some 'eyes' and set it on 4mm rubber cord. I think that it suits the piece beautifully. I set the length to what should be just bit longer than choker-length for most people: it sits high enough to lay flat, but not too high. I'll be more than happy to make a different length cord for you. Lampwork bead set in a silver pendant with gold plate highlights. Readers of my blog and	Facebook page would have been pretty sick of this before too long, but I don't care: I'm proud of it. The bead is a ‘Chaos’ bead, created by pushing the glass through a brass mesh (it’s still inside the bead), then encasing it. I’ve not made many, because they take forever, but might re-consider now! The dots are made using a silver-rich glass, by reducing the glass in a propane-rich flame, you get the metallic shimmer”. It's a bit of a departure from Sabine's normal style, but I just loved it as a soon as I saw it, and wanted to make a piece of jewellery to show it off. A last few details: the toothed bezel round the bead is silver, plated in 24ct gold and the whole piece is about 120mm long and 40mm wide. Those are the hallmarks that you can see toward the bottom. To protect the patination, I polished the piece with Renaissance wax: a very high quality wax (developed by the experts at the British museum for protecting their treasures, no less), so it should keep it's lustre for years. This is definitely a striking piece. If you have a bold evening dress, this will provide the perfect foil, but I imagine it sitting best with a pair of jeans and a black sweater. Go on; prove me wrong. I've taken the liberty of listing this in the 'for men' section, too. Well, why not?